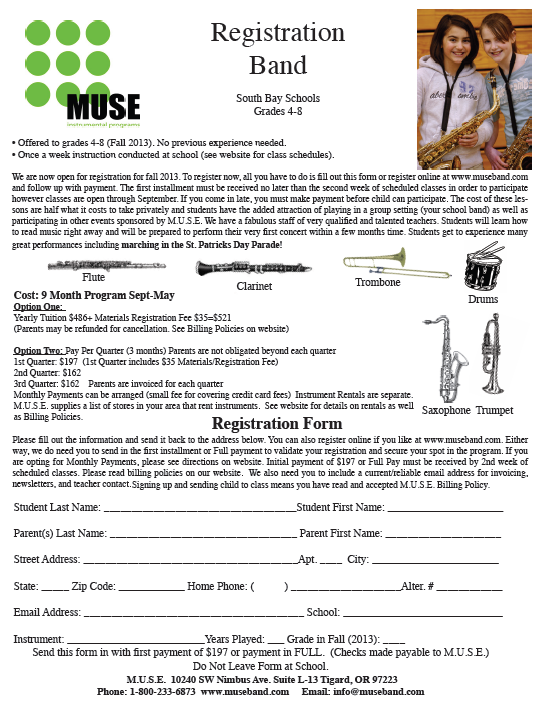 The instrumental music program is provided by M.U.S.E. (Musical Understanding through Sound Education). M.U.S.E. is an organization, which brings a comprehensive instrumental music program to schools that have no such program. There is a cost for participating students, and payments are made directly to M.U.S.E.. This program is offered to students, grades 4-8, ranging in abilities from beginning to advanced levels of proficiency. A band is formed in each school, which promotes fun and enthusiasm of music. It is up to the students involved to make up any work they might miss due to band practice.